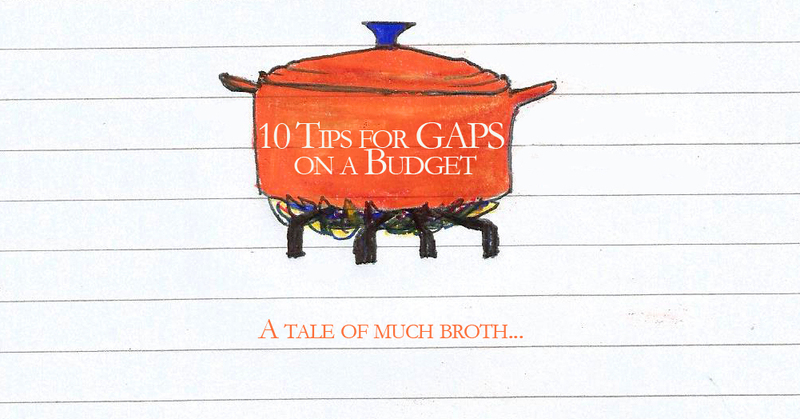 To finish off a GAPS-diet-themed week I thought I would share with you some of my tips for doing GAPS on a budget. As I explained in a previous post, GAPS is a brilliant way to deal with long standing health issues. However, the food and lifestyle involved could potentially be quite expensive. When I began GAPS in January this year we were not in a great financial place and I toyed with the idea of waiting until we could actually afford to follow it fully. But I had lived long enough with a poorly gut, so waiting wasn’t an option. Since then I have managed to budget my way through GAPS (as much as you can eating wholesome food) and we worked out that on average from January – May we (2 hungry people – one of which is a 6’6” man…enough said) spent £85 a week on average. This included all our vitamins+probiotics, bulk buying, veg, cleaning products, lots of hospitality (where we would cater for 10+ people regularly for roasts and dinners), beauty products and anything else health related. This may not seem that cheap, as I was astounded to begin with at the cost (I used to survive on £15-20 food money a week – survive being the operative word) and perhaps many people do it cheaper but I will just share what I have learnt so far so you can do it even cheaper! Before I share my thoughts and budget tips with you I also wanted to share first my belief in spending money on food. Our culture is a very cheap, fast and instant one, where we are not encouraged to bear the responsibility of our actions or spending, so our expectations of food are the same. Supermarkets are very competitive and want every family or individual to shop with them, so they offer family meals for £2, or pizzas for £3. I grew up on having a shop-bought lasagne every week which I think cost my mum £3 at the time and fed four children – bargin! This is our predominant culture and way of thinking. Over time I have become increasingly aware of this and have been challenged myself as I have learned more and more through formal and informal education that what we eat affects our health massively. I now completely believe that food can either help heal us or harm us (and occasionally somewhere in the middle) and have therefore shifted my spending habits. Food is one of the highest outgoings in our budget, alongside rent, bills, and other essentials – for me it holds a primary slot. I have either worked as an artist or for charities/churches the last few years which does not equate to a lucrative income, however, whatever my finances, I can always be wise in my choice of healthy foods because ultimately I aim to live a long healthy life. Note the capital letters – this is key. Sitting down each week to plan what you will eat for breakfast, dinner and lunch is crucial for GAPS and avoiding over-spending. It means I can plan meals that really stretch expensive food like mince, chicken or fish. For example, I may plan a roast chicken on Sunday, make stock that evening, have chicken soup for Monday lunch and chicken+cashew stir-fry on Tuesday. It also prevents that ‘oh I will just run to the shop to buy some …… for dinner’ which inevitably causes the food budget to rise and when you are starving hungry and bone tired the last thing you want to do is make a decision about what to eat. Another useful thing about it is it means you can write an accurate shopping list so that when you are at the shops/market/online you know if its not on the list you don’t need it. Also it means you can organise your week better. On my meal plans I always put a to-do column which may have stuff like ‘defrost chicken’, ‘soak lentils’, ‘make stock’ etc so you can keep on top of stuff bit by bit. There are loads of helpful resources online with inspirational meal ideas, budget recipes and spreadsheets you can download, so it just requires around 30-45 mins of your week and then you don’t need to make any other food decisions all week – brilliant! 2. Learn to Love Bones. GAPS involves a lot of fatty meat. Before I began I wasn’t a massive meat-eater mainly for money reasons but thankfully all the nutritious and healing amino acids in meat that are essential for gut healing are in the bones too. Grass-fed or organic meat is expensive, so a great way round this is to eat lots of broth instead. I use it as sauce in a vegetable chilli or bolognese so I get all the benefits without the price. 3. Make Kefir Your Best (Kitchen) Friend. Probiotics are a big deal in GAPS because as we remove all the pathogenic bacteria we want to equally be replacing it with loads of good bacteria. You can use probiotic supplements for this – which I did to begin with for an added boost but making sure you have large amounts of kefir everyday is another great and cheap way of ensuring a high probiotic intake. Read more about probiotics here and here and more about kefir here. Simple money and sanity saver. With a slow cooker I can put meals on in the morning so when I am home and its dinner time my husband and I don’t have that ‘we are starving and don’t know what to cook, are void of all inspiration so lets go to shop’-feeling which is always followed by the ‘why am I on GAPS, I can’t eat anything…blah blah’-feeling and a spiral into despair and self-pity. Avoid it with a slow cooker. It also means you can buy cheaper cuts of meat and they will taste lovely after a long time in the slow cooker. I use mine to cook curries, casseroles, roast chickens, make stock/broth and cook lentils. I know it may sound awful but honestly its actually quite a nice accompaniment to your meals – plus the fact that a large white cabbage may cost you about £2 but you will yield about 2-4 litres of the stuff! Plus its a great probiotic and filled with loads of other brilliant benefits all for £2 and a wee bit of your time – maybe 20 mins? Go for stuff like oxtail, chicken wings or drumsticks, mackerel, tinned sardines/pilchards/mackerel, lamb neck, bits of bacon or salmon. These will always taste good if cooked properly. Controversial. I would love to week after week eat only organic produce as that is what the GAPS diet recommends. You get to avoid all the nasty chemicals and pesticides and generally they have a higher nutritional value. But when you don’t have the money you just don’t have it, so whilst I always aim to buy organic meat and dairy produce fruit and veg are not as high on the priority list. Someday I will be able to buy organic veg, but right now its not possible and I am not going to stress out about it. After you have been on GAPS for a while you can see if your body can handle haricot beans, if it can then brilliant as beans are a great and cheap way to bulk out meals. I soak mine overnight and cook them for at least 8 hours then use them for homemade baked beans, vegi-burgers, curries or even baked goods. For things like nuts, seeds, coconut oil, cocoa, cleaning products, honey and coconut flour it works out cheaper to buy in bulk. Shop around and see what best deals you can get as it will save you in the long run. Also why not think about starting a co-op in your area with other like-minded people where you can buy in bulk together and split the goods and postage which would save you even more money…and you make friends too! They are expensive. Shopping online is usually cheaper and the selection is more varied (I use amazon loads). Shops have large overheads to cover so they have to charge more, online shops don’t, so unless you want to deliberately support a local health food shop (which I used to do since I believe local shops are important) then you will always tend to find it cheaper online. As a final overarching tip for you: don’t get stressed about it. Yes, you know that organic meat is better for you and on the diet but if you have £1 left in your account and you see some local mince on offer for 25p in the shop well why not buy it? Stress is far more damaging to your gut then any sort of food in my opinion so maintaining your peace about the food you eat is very important. Balance is key, yes I predominantly eat organic meat but sometimes that has not been possible and that is ok. I just remember to be thankful that I have any sort of meat to eat, a home to eat it in and a family to eat it with. So there you have it for now, a few tips on how to heal your gut in an inexpensive GAPS-friendly way. Please note that I have sort of combined both the GAPS diet and the Specific Carbohydrate Diet (SCD) which is a more accessible and inexpensive option as it does not require organic meat, dairy or veg and is filled with more ‘processed’ shop friendly foods. I mainly follow GAPS principles but take inspiration from the cheaper option in the SCD diet.